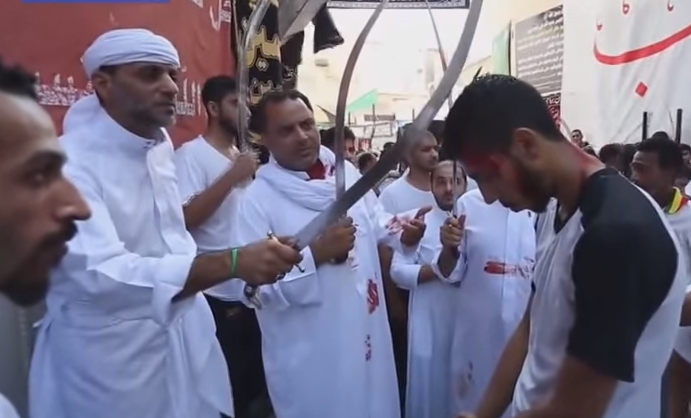 A number of Shiite Muslim men and children around the world are in the midst of observing a 10-day Islamic festival in remembrance of Muhammad’s grandson—an event that involves cutting ones head with knives or spears or self-flagellating themselves with chains. Online photos captured the bloodiness of the Muslim traditions surrounding the Day of Ashura, which marks the death of Husyn ibn Ali approximately 1,300 years ago. He was the son of Fatimah, Muhammad’s daughter, and was beheaded during the Battle of Karbala in 680 A.D.
To remember his death, many Shi’a Muslims (and some Sunnis, although bloodletting is discouraged) observe the Day of Ashura each year, generally in October or November. In countries such as Iran, Iraq, Turkey and Pakistan, the observance is considered a national holiday, which to some also is a time when Muslims seeks to shed blood as a means to obtain forgiveness for sins. However, bloodletting is also largely observed by adherents, often in groups and in the public square. In addition to cutting a gash in the forehead of children and babies, some children and adults voluntarily slash their bodies with knives or flagellate themselves with whips in order to reinact the death of Ali. Participants are seen in some cities walking the streets with blood staining their clothing and dripping from their head, chest and back. According to the AFP, in Iraq, large crowds gathered in the streets on Saturday to observe the Islamic holiday, crying, beating their chests and cutting their heads until their faces and clothes were covered in blood. “Many Shiite worshipers travel from neighboring Iran and other countries each year to visit the [Karbala] shrine, which lies about 80 kilometres (50 miles) southwest of Baghdad,” the outlet explained. In Greece, hundreds of Muslims gathered in Piraeus to flagellate themselves, singing songs and beating their chests, with some covering their faces with mud, according to the Greek Reporter. Photos were also captured of observers bloodying themselves in Bangladesh, Lebanon and Delhi.